Week eighty five and I delved with my usual glee into Mary Berry’s Baking Bible – I thought that perhaps with less than 100 now to go, that my choices would be getting more limited but not yet. There are I must admit some recipes I keep passing over, yes I know I have to do them all eventually…. Any how, I decided this week would be a bit of a cookie fest and I began with Mary’s Chocolate Chip Cookies. The way Mary describes them is that they should be soft and chewy, a bit like Millie’s cookies was what came to mind. I made the dough which was simple enough and then Mary asks you to put large teaspoons of the mixture on to baking sheets, fairly well spaced apart. I managed this and placed the trays in the oven to cook and set the timer. Once the timer had pinged, I removed the cookies from the oven and allowed them to cool on the tray for a few minutes before transferring them to the cooling racks. I was pleased with how they came out and even if I do say so, they were as good as Millie’s cookies. 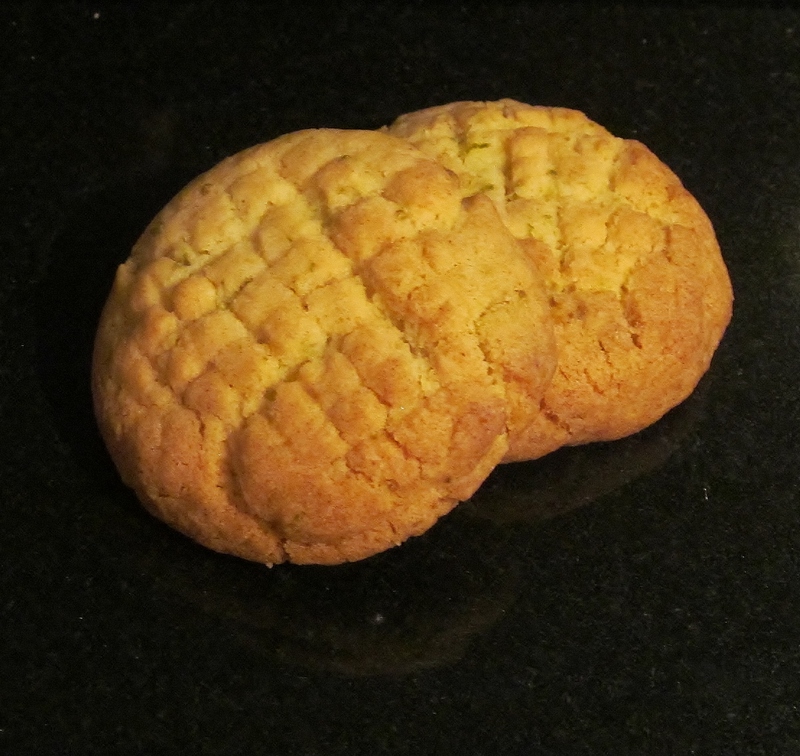 the second batch of cookies were Mary’s lime lattice cookies. Mary’s recipe for this is very simple and the hardest part was finely grating two limes. Mary suggests using a skewer to create a lattice pattern on top of these cookies but I used the wires from an egg slicer instead. Mary asks you to add “walnut” sized pieces of dough onto the trays, create the lattice effect on top and bake. 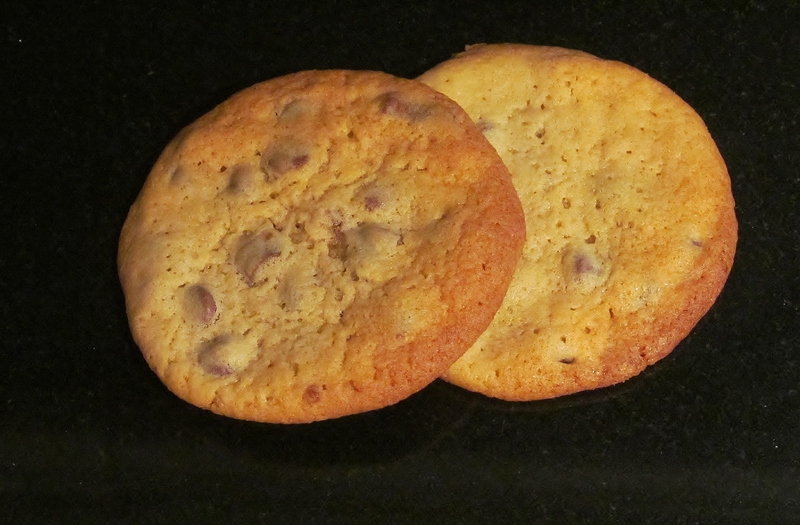 These were zesty and tangy, a lovely contrast to the rich chocolate chip cookies. I am avidly awaiting the new series of The Great British Bake Off which is going to be shown this summer on BBC1. There was an article in The Metro about there being a spin off series on BBC2 called An Extra Slice to show more of the footage etc so I will have more to watch-yippee! This entry was posted in Kim's cake challenge and tagged Baking Bible, chocolate, chocolate chip cookies, chocolate chips, Kim's chocolate chip cookies, Kim's lime lattice cookies, Lime, Lime Lattice Cookies, Mary Berry, Mary Berry's Baking Bible, Mary Berry's Chocolate Chip Cookies, Mary Berry's Lime Lattice Cookies, The Great British Bake Off by kimsideas. Bookmark the permalink.